Yes, as with many of my life dilemmas, I was freed from the blur of misunderstanding when I read Jinmyo's post in the Don't Make Fun of My Sandwich! thread. Pff. 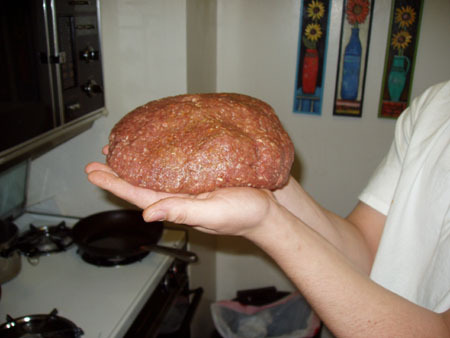 [snip] I fail to understand why burgers are so popular when polpotonne (meat loaf) sandwiches have so many more possibilities, are good hot or cold, and easy to make. And I thought: what a brilliant idea! So! For our tenth Cook-Off, we're going to pick up Jinmyo's gauntlet and battle burgers versus meat loaf. Let's face it: both involve ground meat of some sort mixed with other ingredients (or none) and cooked until done (whatever that means). As we know from the sandwich thread above, many meatloaf acolytes enjoy a slab of their terrine between two slices of bread -- practically a burger, when you think of it. Of course, one of these versions of ground meat is clearly better than the other, and you must surely be in possession of a string of rigorously logical criteria that demonstrates the superiority of your own opinion. So make your case, not only in words but in pictures, through which you can show us all why burgers are best -- or, conversely, why meatloaf is most excellent! As always, we can thank our eGulleteer forebears, who have been struggling with this existential dilemma for some time. 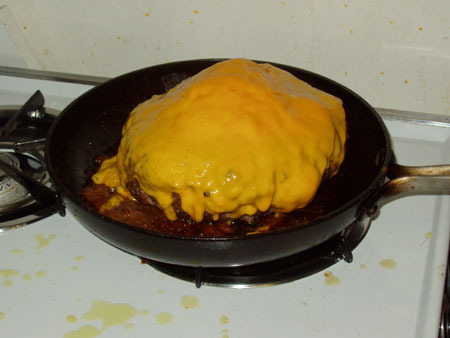 For burgers, there's the The Perfect Burger thread, a slew of threads in the regional forums on burger hunts, the Turkey Burger thread, and the How to Cook a Burger at Home thread. For meatloaf expertise, we have one meatloaf thread, another meatloaf thread, a Meat Loaf Sandwich thread, the best of the several Terrine threads, and the aforementioned "Don't Make Fun!" thread, in which both burgers and meat loaf are discussed. I'll start off by saying that I used to have trouble appreciating a good burger... until I stopped putting all sorts of junk in my ground beef. No dried herbs, no mustard, no chopped onions, etc, etc... Just salt. 90% lean ground beef (of mixed origins) and a healthy dose of salt. All the flavor is already in there, and can be augmented with proper cooking. Grilling over direct charcoal heat is preferable, as a hint of smokiness and intense searing will best enhance the beefiness. Grilling over a high gas flame or cooking in a flat cast-iron pan are also pretty good. Skip the iron "grill pan," as the nice grill marks won't make up for the lack of searing between the lines. Toasted bun is good. Mayo on the bottom half is useful for preventing sogginess. A bit of sharp cheese can really punch things up. All the true snobs here don't need to be told that ketchup has no place here. To be clear, the idea is to pick one and champion it--NOT to do both over a period and document them both? Right? While I'm a fan of picking one and championing it, preferably using sophistry and conniving as if they are rational, I'd be very happy to hear from those whose hearts are torn asunder if forced to choose between chopped meats. I would think that a person could do both, and compare! Now that I think about it, I might not have to heat up the kitchen with the oven, but experiment with gilling a meatloaf. Just wondering: is this cook-off limited to US style burgers and/or meat loaves, or are other recipes acceptable? It's just that I have this very intriguing Neapolitan recipe I never tried but which "I''ve always wanted to make at home", and it seems a perfect meeting point between burger and meat loaf . Here in "Iamamoronandrippedoutmykitchenland" I HAVE done a meatloaf on a grill, on the Weber no less, with smoke. I highly reccomend it as a worthy project. It was pretty great, actually. I will have to do it again for this brilliantly conceived cookoff. Someone could really screw things up if they used the left over meat for meatballs and reported on that as well. I'm thinking of any type of burgers or meatload. We have a winner with MEATLOAD! No limits, man.... Bring on those Neapolitan wonders! Philosophical question to ponder: what is the difference between the loaf, the patty, and the ball? Shape? Size? Nomenclature?? Meatloaf on the grill. Now that is just genius. Do you put it in a pan? How do you get it to take up the smoky goodness? Now you have given me a whole new problem to worry about. And to think, I was stuck in the ketchup or no-ketchup dilemma for meatloaf. I hope people will try out burgers and loaves made with meats besides beef and beef blends. I make a lot of turkey burgers, both at home and back at the sorority house. Sysco carries only "mechanically separated" turkey, which is a lot looser and wetter than the extruded product I buy at the supermarket for burgers at home. I thought it was a little gross to work with, but my husband is a big believer that mechanically separated turkey makes for a much better burger. I didn't like that I had to add breadcrumbs to soak up all that extra liquid. I learned how to pat some of the liquid off, and how to lift the turkey out of the package leaving more excess liquid behind. I think the mechanically separated turkey makes a superior turkey meatloaf--very popular with weight-conscious sorority sisters. 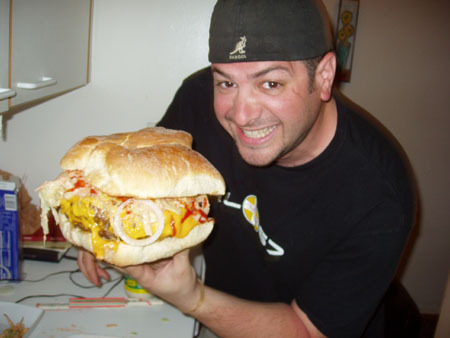 Sutter Home's Build a Better Burger contest has a lot of creative past winners. You can view some recipes here. I also recommend the Fear of Grilling chapter in Amy Sutherland's Cookoff book for a fascinating behind-the-scenes look at this particular contest. I always add ricotta to my turkey/chicken burgers, along with some McCormick's Seasoned Salt. That's what they need. Of course, I usually get ground chicken thighs from Whole Foods, which adds some flavor. Men don't eat this kind of thing. Burgers are made from beef (it's what's for dinner!). That's the way that it works. You will have to start a new thread. You could title it, " These burgers aren't really very good, but I have convinced myself that they are"
I'm with Brooks on beef. I also want to add a link to a particular question asked during Q & A with Danny Meyer of Blue Smoke where he discusses his Burger Meat Mixture. I am so in this one! The cast is off the foot, the weather is gorgeous, hamburgers on the BBQ!! I would think with your standard ground round you'd need a drip pan, at least, with all the fat that will melt out. If anyone BBQ's a meatloaf, post pictures please! If you're doing a typical comfort food-type meatloaf, yes on the ketchup. And don't forget the strips of bacon on top. I didn't like that I had to add breadcrumbs to soak up all that extra liquid. So you don't normally add breadcrumbs to your meatloaf? I made a meatloaf once, thinking "I don't need a meat-stretcher like bread crumbs" so I left them out. I could have used the resulting meatloaf as a doorstop, it was so "heavy". My mom always soaks a couple slices of bread in milk, squeezes out the milk and shreds it into the meatloaf mixture. To me, the bread or breadcrumbs helps make the meatloaf a less dense end product. Yeah, it would be a bit wacky if beef wasn't essential to this. Maybe there should be a rule that whatever is made, no matter what it is, has to contain at least half beef, so things don't get totally crazy with Turkey this and Buffalo that. Although that reminds me, my dad recently has been hawking a burger formula which is 50% Venison. He claims it works shockingly well mixed with Beef. I like ground pork in my meatloaf. I saw a commercial not long ago for some sort of antacid and the mom was ladling brown gravy over the meatloaf. How do you make brown gravy from meatloaf? I just wanted to start this off proper like... This is an old photo of mine... Its 5 pounds of meat to start off and 1 egg to hold.. Worshtishire sauce and a ton of black pepper.. A half pound of cheddar, an onion, mad pickles, and what nots.,,So technically it satisfies both catagories.. Raw meats. I asked for five pounds of ground beef and the butcher was out, so the 22 year old kid was burning 12 dollar steaks to give me 5 pounds at 3.99 a pound. Then handed to a friend who went mad... There were stories involved, but i still think he will be back. When your wife don't eat no mammal meat, you take what you can get. So, I make do with these. When I want a good burger, and I mean a REAL burger, I grind my own meat, homie. this is getting a little too macho for me. Personally, I think a turkey burger is much harder to do well than one from chuck--they're usually dry hockey pucks. The few good ones I've had have been excellent. So some tips on how to do them well would be appreciated. I guess this is not the thread for mentioning the excellent veal ("polpettone") loaves in Marcella Hazan's cookbooks.